Luminous stars dominate the ecology of the Universe. During their relatively brief lives, massive luminous stars gradually eject enriched gas into the interstellar medium, adding heavy elements critical to the formation of future stars, terrestrial planets and organics. In their spectacular deaths as supernova explosions, massive stars violently inject even more crucial ingredients into the mix. The first generation of massive stars in the history of the Universe may have laid the imprint for all future stellar history. Yet, massive stars – rapidly spinning and with radiation fields whose pressure resists gravity itself – are arguably the least understood, despite being the brightest members of the familiar constellations of the night sky. Other less-massive stars also contribute to the ecology of the Universe only at the end of their lives, when they brighten by factors of a thousand and shed off their tenuous outer layers. A group of 7-kg, 20x20x20cm nanosatellites in space, called BRITE (BRIght Target Explorer) Constellation, will capture the light shed by luminous stars and in turn shed light on their structures and histories, uncovering unique clues to the origins of our own Sun and Earth. 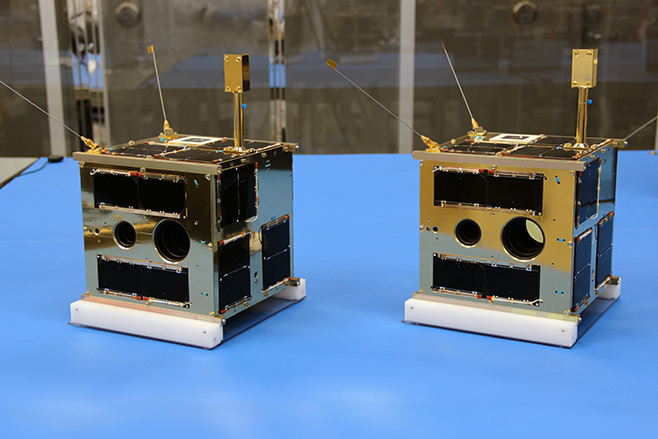 The BRITE Constellation will be a cost-effective fleet of six nanosatellites based on pioneering Canadian space technology developed at SFL, built in partnership with Austrian and Polish space scientists. 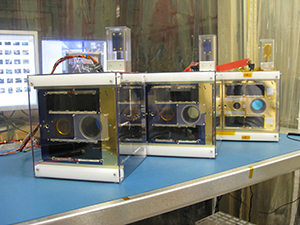 The BRITE nanosats will survey the sky, measuring the brightness and temperature variations of the brightest stars on timescales ranging from hours to months. The photometric data of luminous stars will provide time series with unprecedented accuracy that cannot be obtained from the ground due to limitations imposed by the terrestrial atmosphere. BRITE Constellation will investigate the role stellar winds play in setting up future stellar life cycles, and reveal pulsations that will allow astronomers to probe luminous star histories and ages through asteroseismology. 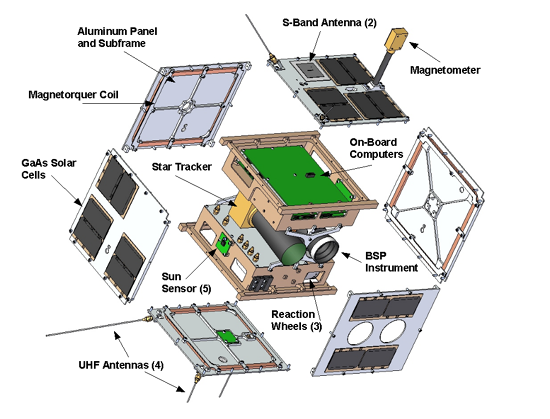 Each BRITE nanosat will carry a telescope and detector with a large field of view (~24 degrees across) that can monitor multiple target stars, so that differential photometry can be obtained both in brightness and color with precision better than 0.1% for a single observation. The Constellation of BRITE nanosats offers an order-of-magnitude improvement in science return over a single nanosat, since it allows the use of two different filters and provides superior time and sky coverage. BRITE Constellation will also be able to collect this quality of data on a wide variety of other bright star types and phenomena. For example, the detection of exoplanetary transits around other stars will put our own planetary system in context, and the pulsations of red giants will test and refine models of the eventual fate of the Sun. BRITE Constellation will be the first network of satellites devoted to a fundamental problem in astrophysics, extending and supplementing the spectacular success of the Canadian MOST microsatellite into the domain of nanosats and providing on-orbit experience for future coordinated satellite networks. 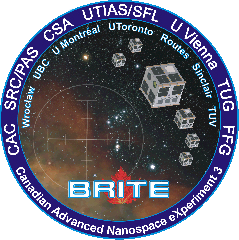 BRITE Constellation will exploit and enhance recent Canadian advances in precise attitude control that have opened up for space science the domain of very low cost, miniature spacecraft, allowing a scientific return that otherwise would have had price tags 10 to 100 times higher.